Employment certification letter is written to certify a certain individual about his/ her employment. This letter serves as a written announcement that he/ she is authentically employed in a certain company. If you are planning to change your job, on your departure from your current company you are required to request an employment certificate letter. This letter also verifies the skills, experience, educational and professional qualification. You can request this letter for visa application, loan application and so on. Hence, this certification letter serves as an important document in several matters of life. This letter certifies your performance while applying for a certain position in a company. This is a proof that you have worked in the company. It is issued by the Human Resources Department as they keep records of all the employees. Therefore, if you are requesting for such letter you should provide a genuine reason for which you need this and where you use it. Every company has its own format of employment certificate letter. However, they all most likely follow the standard business letter format. 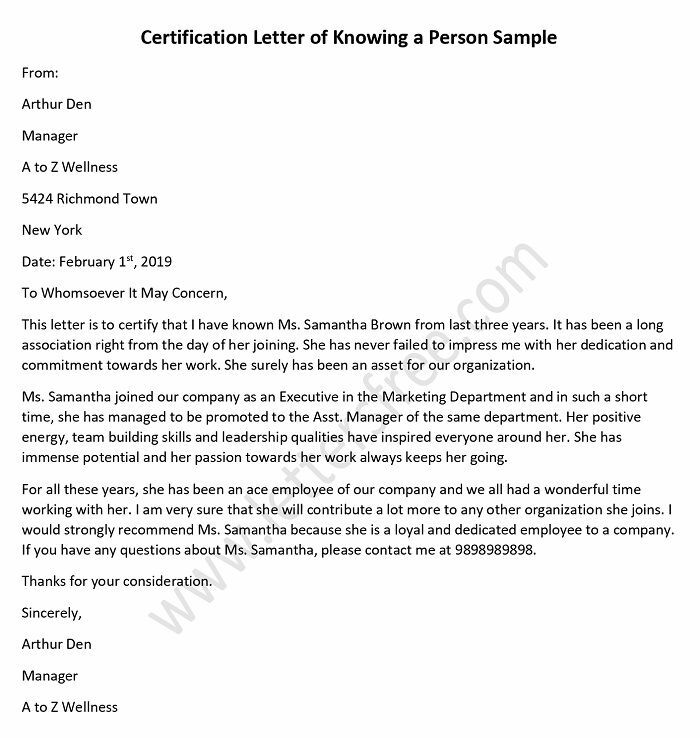 This letter is to certify that Mr. William Brooks has been an employee of Thomas Enterprises since 1 March, 2010 till date. He is working on the position of Head Sales and Marketing. Mr. Brooks has been a very punctual and honest employee to our company. He has also winning won the best employer award of 2013 for his outstanding performance. He is a self motivated person handling the team of 55 employees. He has a record of completing all his targets before the deadline. He would be a proud to any company he chooses to work for. Kindly contact me for further inquiries and verification regarding him on the mentioned contact numbers. Company certification letter is usually requested to the current and former employers by the employees. This letter serves as a legal verification in several maters. Sample Medicare certification letter is issued by a central insurance program to provide great range of reimbursement for definite periods of time. Financial certification letter provides a certification for the financial support offered by a third party to support an individual for a certain purpose. Volunteer certification letter is used to verify the qualification, skills, work record and other characteristics of a volunteer. This is usually written by the society/organization where an individual has worked as a volunteer. Sample Job certification letter is written to formally certify a particular person that he/ she is presently employed in the company.